Vietnam is a country where you can find innumerable corners to be discovered, infinite experiences to be lived, countless histories to be told after your trip. Do not hesitate to spend 20 days exploring this wonderful country by choosing our Vietnam Discovery Tour. You will visit most of highlights on a beautiful S shape land, from the bustle cities as Ho Chi Minh, Hanoi to the charming old town like Hoi An, not except the World Natural Heritage - Halong Bay or remote beautiful town in the mountain northern - Sapa. Upon arrival, you will be warmly welcomed by your local guide and transferred to the city and to your hotel. The room is at disposal at 2.00pm. In the morning, our local guide will pick you up at hotel around 08:00 to transfer to Cu Chi Tunnel (30km to 40 km from Saigon). At its height, the tunnel system stretched from Saigon to the Cambodian border. The network, parts of which were several levels deep, included innumerable trap doors, specially constructed living areas, storage facilities, weapons factories, field hospitals, command centre and kitchens. If be interested, you have opportunity to descend down the tunnels to understand how harshly the Vietnam guerrillas live during the war. Then drive back to the city. Have lunch at local restaurant. After that, proceed to discover the largest city in Vietnam – Ho Chi Minh city with its most prominent attractions such as Reunification Palace, Notre Dame Cathedral, Saigon Center Post Office and visit the ethnic Chinese district at Binh Tay Market. End tour at your hotel about 17:00 pm. You will be transfer from Ho Chi Minh City downtown to Cai Be district on morning. Arriving in Cai Be, you will be welcomed by the hospitable smile of the host and invited some fresh fruits before embarking on boat to visit Cai Be Floating Market and traditional handicraft villages. You’ll have an opportunity to talk to the sellers on their boats. The boat will then lead you to the home-stay on Tan Phong Island for checking-in and having lunch. In the late afternoon, you will visit the vegetable garden and gather the vegetables for your dinner. You yourself will prepare your own dinner with the help of local host. Waking up in the early morning to enjoy the fresh air of Mekong region and then taking a stroll around the home-stay, your 2nd day tour in Mekong will start. Coming back to the home-stay where the delicious breakfast is waiting for you. After breakfast time , you will join a bicycle tour around Tan Phong Island to visit the traditional handicraft workshops of handbags, rice papers along with wooden tables and chairs. Afterwards, we will return to the home-stay for check-out. Have lunch at homestay. Then, small boat will transfer you back to the Cai Be tourist boat wharf and transfer back to Ho Chi Minh City. You will get back hotel around 05:00 pm. Free at leisure until be picked up and transfer to the airport to take a flight to Da Lat City. 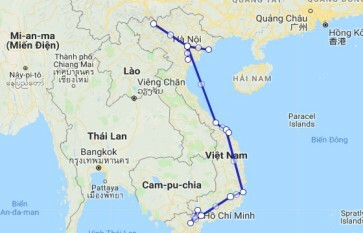 It takes around 1 hour to fly from Ho Chi Minh to Da Lat. Upon arrival at Da Lat Airport, be welcomed and picked up by our driver to transfer to Da Lat hotel. Check in hotel and free at leisure to enjoy the city. At 08:00 am: Our guide pick you up at your hotel to start discovering Da Lat City. You will first visit Prenn Waterfall (about 10km away from Da Lat on the way), then visit Tuyen Lam Lake, Truc Lam Pagoda..
Have lunch at Local Restaurant in Da Lat. Then transfer to Nha Trang (driving around 2.5 – 3 hours). Upon arrival, check – in hotel and free at leisure at the rest of day. 08:00 am: Be picked up at your hotel to transfer to Cau Da and visit Vietnam Oceanographic Institute which is one of the first oceanographic research center in Vietnam. You will have opportunity to see the whole collection of sea creatures and understand a part of marine ecology diversity in Nha Trang Bay. Then continue to visit Long Son Pagoda, Catheral or Stone Church built in French colony time, Chong Promontory Rocks – behold romantic landscape. After that, visit Po Nagar Temples to learn more about the Champa culture and architecture. Finishing the day by a visit to local Dam Market with a range of colorful goods, stalls and vendors that offer another aspect of local lives or various opportunities for photos. Then come back to Nha Trang hotel and free at leisure the rest of the day. Free at leisure until being picked up and transferred to the airport to take flight to Da Nang. Upon arrival, you will be welcomed by our driver at Da Nang Airport. Then transfer about 30 minutes to hotel in Hoi An. Check – in hotel and enjoy the offering of ancient town at the rest of the day. 8:00: The local guide meets you at hotel lobby. You choose a bicycle. Then ride to local farm in Tra Que Village. You will take a trip around the vegetable garden and join the farmers in preparing the land and fertilizing it with seaweed from the local lake. Continue doing some next steps such as: raking the ground, sowing, watering greens, picking greens and many more gardening activities. Then spend the rest of the morning working the land in the time honored way, before breaking to prepare lunch with a local family. Your lunch with consist of many local delicacies including ”tam huu” spring roll, banh xeo or local pancake of people’s middle region. After your lunch and the exertions of the morning, take an even more traditional Vietnamese postprandial - nap before learning how to harvest and wrap the vegetables. 13:00: Let's us bid farewell to your host family , ride back to Hoi An. Visit Japanese tomb on the way back. From there, you will start a walking tour around cozy Hoi An Old Town with Japanese – covered bridge, Tan Ky old house, the Cantonese congregation, etc. Then free at leisure to shop for souvenirs such as silk, handicrafts, etc. at bargain prices. Free at leisure. You can spend your day at Cua Dai Beach – a long beach which stretches from Da Nang to Hoi An. Marked by white sands, local seafood restaurants with views of limestone islands in the distance, Cua Dai is a relaxing beach to indulge in the fascinating awesome surroundings. In this morning, our driver will pick you at your hotel and then transfer to Hue Imperial City – the most important historical and cultural monument of Vietnam that was recognized as World Cultural Heritage Site by UNESCO. Along the way we will stop in the proximity of Da Nang for the “best coastal way” Hai Van pass, Marble Mountain with a handicraft village or Cham museum for a glimpse of Cham Kingdom once dominated across Indochina. Upon arrival to Hue, have lunch at local restaurant. Then go to hotel for check – in. Free at leisure to discover the city offerings. After your breakfast at your hotel, our local guide will pick you at hotel around 08:00 am to join the full day tour in Hue. Start by boarding a boat to cruise on Perfume River then visit towering Thien Mu Pagoda. You will have opportunity to understand about the underlying legends of the pagoda that also about the origin of this city while enjoying a scenic panorama overlooking the idyllic Perfume River and faraway mountains. Return to the center of Hue city to visit the massive Kinh Thanh Citadel. You will be able to see the sprawling complex comprised of the Imperial City itself, with museums, lakes, lovely gardens in a series of concentric circles. Also visit the Forbidden Purple City, originally built in the early 1800s for the personal use of the emperor and once staffed by eunuchs who posed no threat to the royal concubines. Nearly destroyed in the Tet Offensive, the ruins today house the Royal Library and the grounds flourish with mimosa plants and vegetable gardens. Free at leisure the rest of the day and overnight at Hue Hotel. In the morning, free at your leisure till be picked up to transfer to Hue Airport to get the flight to Hanoi (about 1h30'). Embark on the trip to visit Ho Chi Minh Complex (Ho Chi Minh Museum, One Pillar Pagoda, Ho Chi Minh’s stilt house). Then, you will have a glimpse at the first Vietnam University - the thousand-year-old Temple of Literature. Next, discover the various architecture of Hanoi and its famous 36 streets of Old Quarter by combine between walking and cycling. Come back your hotel for relaxing. 8:00 am: Our local guide and drive pick you up at your hotel, transfer to Ninh Binh. An hour for lunch at local restaurant with local food. After lunch, take the amazing boat trip to visit Trang An grottoes which is a gathering of 31 valleys, 50 cross-water caves, and home to 600 kinds of flora and over 200 kinds of fauna, many of them in the Red Book of Vietnam. While rowing through Trang An grotto in the quiet, fresh air of the highlands, with only the sound of birds and the oars stirring the clear water and surrounded by magnificent forested mountains upon which graze white goats, visitors enjoy a heaven on earth. The end of the day, drive back to Hanoi. Leave Trang An around 16:00 pm and drive back to Hanoi. Arrive Hanoi at 6:30 pm. 8:00 am: Be picked up at your hotel and then transfer to Restaurant where you can enjoy and try a wide range of authentic food as well as the interactive cooking classes with our skillful, friendly, enthusiastic and English-speaking staff members. The Chef is a fantastic local expert who will guide you through how to cook authentic and traditional dishes that we proudly serve in the restaurant. Let’s take a chance to enjoy Vietnamese cooking. All guests will receive detailed recipe cards and a certificate to take home at the end of the class. After that, we take you back to your hotel. Free at leisure the rest of the day and prepare for the night train to Sapa. At around 20:00 pm, you will be picked up and transferred to Hanoi Train Station for an overnight train to Sapa. Arrive Lao Cai Train Station around 6:00 am. Then take one hour bus ride uphill to the beautiful town – Sapa. The rides give you a glimpse of the stunning vistas and impressive rice terraces that make Sapa famous with travelers. Upon arrival to Sapa’s town, have breakfast and freshen up before your trekking of the day. km of walking down to the south east of Sapa along the side of Muong Hoa valley to Y Linh Ho Village of the Black H’mong. And then 3km trekking down to Lao Chai Village, 4 km through terraced rice fields to Ta Van Village of the Dzay minority people. Have lunch at a local family, where you can see the local house architecture and witness local daily life styles and exclusive customs. Enjoy the landscapes on the way until getting back to Sapa by jeep or motorbike in the afternoon and free at leisure the rest of the day. Overnight at Sapa Hotel. Today, take a walk down to the South-west of Sapa (around 3 km) to visit Cat Cat Village of the Black H’mong. Relax at the foot of the stunning waterfall and the vestige of a hydroelectric power station that was constructed by the French during the colonial time in Vietnam. Enjoy picnic lunch by the side of the river, and then continue your trekking for the next 3 km to Sin Chai Village, the village located at the foot of Fansipan Mountain, “the roof of Vietnam and Indochina”, where you can enjoy a stunning landscapes of the mountain. Then come back to the main road to be transferred to Sapa’s town on a jeep. Freshen up and check out for a bus to Lao Cai station at 18.00. Arrive Hanoi at around 5:00 and get transferred from Hanoi Train Station to Hanoi hotel (pay by your account). Freshen up, enjoy your breakfast and relax until being picked up and transferred to Halong Bay by the shuttle bus of your Halong Bay cruise. Driving around 3.5 hours via the Red River. Upon arrival Halong Bay, you will be welcomed on board for a cruise and set sail in the bay while lunch is served. Cruising further in the magical bay, you can see thousands of sculpted limestone islands rising from the waves like dragons' teeth on the turquoise waters. After lunch, take a short trek to a nearby summit for a panoramic view of the bay, swimming or sunbathing. Late afternoon, visit an interesting village. At sunset, kayak or simply take a bamboo rowboat to discover a water tunnel with many coral reefs in a scenic lagoon. Back on board or junk, enjoy watching the peaceful sunset and later unwind at a restaurant with dinner is served. Overnight on boat. Wake up on the bay. You will have opportunity to view the sunrise over the bay. After breakfast, visit a wonderful limestone grotto then walk back to the boat for a final glimpse of the majestic Halong Bay while cruising back to the pier. Get picked up and transferred by the shuttle bus to Hanoi. Free at leisure the rest of the day and overnight at Hanoi Hotel. In the morning, have breakfast at the hotel. Free at leisure until being picked up and get transferred to the airport for your onward flight. Private package Very accommodating with changes due to weather conditions and made all changes on the spot. This style of tour is great if you don't want to be a part of a tour group. All guides are helpful and nice. We booked our entire holiday through Asia Package Travel. The best service and excellent itinerary. Everything went to plan. Tours were exactly what we wanted. Guides were knowledgeable and the services was personal and pleasant. Hotels were comfortable and clean. Cars met us at airports and hotels on time every time. I recommend Asia Package Travel to any one who wants a truly hassle free holiday.